They seem to of had a lovely time which is good. They went for their 40th wedding anniversary with a couple of their friends, all round the Mediterranean. 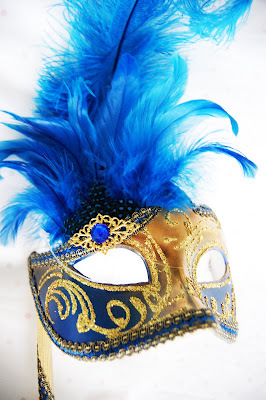 They got me this stunning masquerade mask from a little shop in Venice. It’s so beautiful. I love the colours. I’ve hung it at the top of the mannequin in my room. They also got me a handmade bag from Kefalonia which is really sweet. They brought me back all 34 of the chocolates they were put on their pillows each day. Nom nom nomm. Also I got this lovely silver bracelet from another friend. I love it. Its really simple and delicate and will look great with anything. Even the packaging is lovely! So there you go. I think it’s fair to say I’ve been a little spoilt, but aren’t we all from time to time? I’m off to my sister’s house for tea shortly with all the family. I’ll be back tomorrow with a Three For Thursday post, and hopefully a new look for my Lookbook account. "THREE FOR THURSDAY…& other stuff"
Those presents are adorable, when was it your birthday? It was mine on the 16th and my friends went all out! I felt so guilty, they spent so much!